Oh jeez, not another flexible, scalable, groundbreaking, industry-standard, cutting-edge product from a market-leading, well positioned company! Ugh. I think I'm gonna puke! Just like with a teenager's use of annoying catch phrases, I notice the same words cropping up again and again in Web sites and news releases—so much so that the gobbledygook grates against my nerves and many other people's, too. Well, duh. Like, companies just totally don't communicate very well, you know? Many of the thousands of Web sites I've analyzed over the years and the hundred or so news releases I receive each week are laden with these meaningless gobbledygook adjectives. So I wanted to see exactly how many of these words are being used and created an analysis to do so. 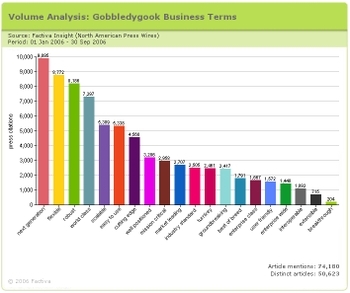 First, I selected words and phrases that are overused in news releases by polling select PR people and journalists to get a list of gobbledygook phrases. Then I turned to Factiva, a Dow Jones & Reuters Company, for help with my analysis. The folks at the Factiva Reputation Lab used text mining tools to analyze news releases sent by companies in North America. Factiva analyzed each release in its database that had been sent to one of the North American news release wires it distributes for the period from January 1, 2006, to September 30, 2006. The news release wires included in the analysis were Business Wire, Canada NewsWire, CCNMatthews, Commweb.com, Market Wire, Moody’s, PR Newswire, and Primezone Media Network. Thanks to David Hamm, Glenn Fannick and Melanie Surplice at Factiva for their help. The results were staggering. (Click on the chart to load a larger image). The news release wires collectively distributed just over 388,000 news releases in the nine-month period, and just over 74,000 of them mentioned at least one of the Gobbledygook phrases. The winner was "next generation," with 9,895 uses. There were over 5,000 uses of each of the following words and phrases: "flexible," "robust," "world class," "scalable," and "easy to use." Other notably overused phrases with between 2,000 and 5,000 uses included "cutting edge," "mission critical," "market leading," "industry standard," "turnkey," and "groundbreaking." Oh and don't forget "interoperable," "best of breed," and "user friendly," each with over 1,000 uses in news releases. Your buyers (and the media that cover your company) want to know what specific problems your product solves, and they want proof that it works—in plain language. Your marketing and PR is meant to be the beginning of a relationship with buyers and to drive action (such as generating sales leads), which requires a focus on buyer problems. Your buyers want to hear this in their own words. Every time you write—yes, even in news releases—you have an opportunity to communicate. At each stage of the sales process, well written materials will help your buyers understand how you, specifically, will help them. Whenever you set out to write something, you should be writing specifically for one or more of the buyer personas that you want to reach. You should avoid jargon-laden phrases that are over-used in your industry. In the technology business, words like "groundbreaking," "industry-standard," and "cutting-edge" are what I call gobbledygook. The worst gobbledygook offenders seem to be business-to-business technology companies. For some reason, marketing people at technology companies have a particularly tough time explaining how products solve customer problems. Because these writers don’t understand how their products solve customer problems, or are too lazy to write for buyers, they cover by explaining myriad nuances of how the product works and pepper this blather with industry jargon that sounds vaguely impressive. What ends up in marketing materials and news releases is a bunch of talk about "industry-leading" solutions that purport to help companies "streamline business process," "achieve business objectives," or "conserve organizational resources." Huh? When I see words like "flexible," "scalable," "groundbreaking," "industry standard," or "cutting-edge," my eyes glaze over. What, I ask myself, is this supposed to mean? Just saying your widget is "industry standard" means nothing unless some aspect of that standardization is important to your buyers. In the next sentence, I want to know what you mean by "industry standard," and I also want you to tell my why that standard matters and give me some proof that what you say is indeed true. People often say to me, "Everyone in my industry writes this way. Why?" Here's how the usual dysfunctional process works and why these phrases are so overused: Marketers don't understand buyers, the problems buyers face, or how their product helps solve these problems. That's where the gobbledygook happens. First the marketing person bugs the product managers and others in the organization to provide a set of the product's features. Then the marketing person reverse-engineers the language that they think the buyer wants to hear based not on buyer input but on what the product does. A favorite trick these ineffective marketers use is to take the language that the product manager provides, go into Microsoft Word's find-and-replace mode, substitute the word "solution" for "product," and then slather the whole thing with superlative-laden, jargon-sprinkled hype. By just decreeing, through an electronic word substitution, that "our product" is "your solution," these companies effectively deprive themselves of the opportunity to convince people that this is the case. Another major drawback of the generic gobbledygook approach is that it doesn't make your company stand out from the crowd. Here's a test: Take the language that the marketers at your company dreamed up and substitute the name of a competitor and the competitor’s product for your own. Does it still make sense to you? Marketing language that can be substituted for another company's isn't effective in explaining to a buyer why your company is the right choice. I'll admit that the gobbledygook phrases I chose are mainly use by technology companies operating in the business-to-business space. If you are writing for a company that sells different kinds of products (shoes, perhaps), then you would probably not be tempted to use many of the above phrases. The same thing is true for nonprofits, churches, rock bands, and other organizations—you're also unlikely to use these sorts of phrases. But the lessons are the same. Avoid the insular jargon of your company and your industry. Instead, write for your buyers. "Hold on," you might say. "The technology industry may be dysfunctional, but I don't write that way!" The fact is that there is equivalent nonsense going on in all industries. Here's an example from the world of local government. "The sustainability group has convened a task force to study the cause of energy inefficiency and to develop a plan to encourage local businesses to apply renewable-energy and energy-efficient technologies which will go a long way toward encouraging community buy-in to potential behavioral changes." Hmm... What the heck is that? Or consider this example from the first paragraph of a well-known company's corporate overview page. "…[Company X] has remained faithful in its commitment to producing unparalleled entertainment experiences based on its rich legacy of quality creative content and exceptional storytelling. Today, [Company X] is divided into four major business segments… Each segment consists of integrated, well-connected businesses that operate in concert to maximize exposure and growth worldwide." Can you guess the company? Answer here. Your marketing and PR is meant to be the beginning of a relationship with buyers (and journalists). This begins when you work at understanding your target audience and figure out how they should be sliced into distinct buying segments or buyer personas. Once this exercise is complete, identify the situations each target audience may find themselves in. What are their problems? Business issues? Needs? Only then are you ready to communicate your expertise to the market. Here's the rule: when you write, start with your buyers, not with your product. Your online and offline marketing content is meant to drive action (such as generating sales leads), which requires a focus on buyer problems. Your buyers want this in their own words, and then they want proof. Every time you write, you have an opportunity to communicate and to convince. At each stage of the sales process, well written materials combined with effective marketing programs will lead your buyers to understand how your company can help them. Good marketing is rare indeed, but a focus on doing it right will most certainly pay off with increased sales, higher retention rates, and more ink from journalists. I'll be writing a lot more about this in my upcoming book The New Rules of Marketing and PR which will be published by Wiley in mid 2007. Do you have favorite gobbledygook phrases? Comment on this post or on your blog with a trackback and let me know. Larry Schwartz at Newstex has offered "anything 2,0" as in Web 2.0 and PR 2.0 as his nomination. What about you?